In Nurses Who Love English, Paula Marie Coomer chronicles the Sept. 11, 2001, attacks and from the emergence of war to a life wobbling under the impact of world events: the loss of livelihood caused by federal budget cuts, a year of unemployment, record gasoline prices and mega-inflation, and a return to hospital nursing after having been a contracted university professor, with its accompanying effects on a 50-year-old body. In the shadows, events that should have been celebrations become emotional struggles: the empty nest, children marrying and becoming parents themselves, finding late-life love. Lyrical, emotional, and, in the words of poet Paisley Rekdal, “both tough-minded yet fragile,” the poems in this collection reveal the conflicting perspectives of a persona struggling to survive alone in the rural American West one of the most difficult times in modern history. How fitting that Mark Rothko, that godfather of “big emotions – tragedy, ecstasy, doom,” graces these pages early, for Nurses Who Love English depicts the expansive vision of a poet who’s also a mythmaker-philosopher, one working to find tentative purchase for aching baby-steps that might bear her through the rubble of a ravaged landscape — less urban or rural, more the terrain of that “curious church,” the human heart. Birthed from conflict, these lyrics gesture toward archetype — thick with smoke, heavy as “clotted pelt” in the hands — marrying the dark politics of Ai with the daily praise of Stafford. Paula Marie Coomer’s hold on language is taut and elegant as rimed barbed wire, glinting in unexpected ways to shine beauty on what’s beleaguered, downtrodden, defiled, lost – the “early-me trinkets” burnished bright by the “toil of transience” to render poems able to witness and sing their stung, stunned, and often stunning narratives. Coomer’s is a voice tempered by fire, fierce with triumph; Nurses Who Love English heralds a poet embarked on the urgent task of forging out of all that’s ancient a bright new language.” —Katrina Roberts, author of Friendly Fire and Underdog. In poems at once carefully wrought and yet full of spontaneity, that collage the language of Rilke together with the language of the hospital ward, the movie theater, and the homes and hearts of those down on their luck, Paula Coomer’s newest collection of poems examines the many ways in which we make art out of our lives, both consciously and not. The speakers of these poems are both tough-minded yet fragile, alive to the beauty and power of language and its ability to transform pain into moments of true personal grace. To live, as these poems show us, is itself an art. 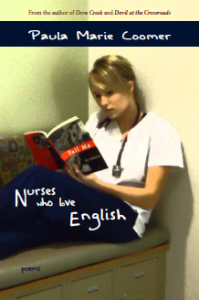 “You asked yourself the question–have I Iived?” Paula Coomer asks in Nurses Who Love English. The answer is, unquestionably, she has. —Paisley Rekdal, author of Animal Eye and The Night My Mother Met Bruce Lee.